And some expansion news as well. We often get asked what's new around the brewery, and sometimes things are happening so fast that we can't even remember everything going on. So, today we sat down and thought about all the new projects we have in November & December. Here's a sampling of what's new: We put in a new loading dock in November. We just received a shipment of over 800 new kegs this week. By the end of December, we'll be installing a new grain silo, 2 more fermenters and another brite tank. All of this expansion means we get to make more beer, and we're now starting to expand beyond the Twin Cities! We began distirbuting beer to the North Shore in November, so if your winter plans take you that way, be sure to look for Fulton on tap and in bottles. That's right -- Worthy Adversary is back, and it's better than ever. Or maybe it's the same as ever, but we've just missed it a lot these last 8 or 9 months. Either way, we've been busy brewing and packaging Worthy Adversary over the past six weeks, it's tasting excellent, and this weekend we'll finally be able to share it. Worthy Adversary will be available on draft and in growlers at the taproom when we open the doors Saturday at noon. We expect a good crowd, but don't worry, there should be enough for everyone. Never had Worthy Adversary? It's our winter seasonal, a Russian Imperial Stout that punches in at 9.5% ABV. It's is a big beer in every sense, yet has the drinkability of a much smaller beer. Reminds us of something Jack Donaghy once told Liz Lemon. 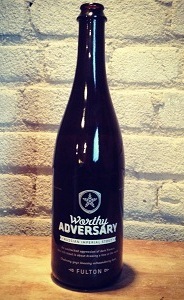 After Saturday's taproom release, Worthy Adversary will be available in bars for the next couple months. To kick things off, we're doing some launch events. 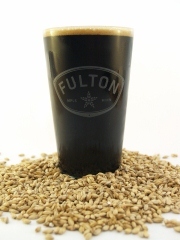 On Wednesday the 12th at Pig & Fiddle, Chef Stephanie will be making stout pudding to pair with your Worthy. Then, on Friday the 14th, Grumpy's Northeast will be pouring a firkin of Worthy aged on macadamia nuts. And downtown happy hour-goers take note: The Local is tapping a keg on Thursday 12/20. If you'd like a bottle or two to savor at home, you're in luck: Starting on Monday, 12/17, you'll also be able to pick up 750mL bottles in liquor stores all over the metro area. Just like Libertine bottles, these will be available in limited quantities, and priced at $10-11 each. Bonus tips: after you're finished the beer, the bottle makes a very attractive vase. Or, use it as a water bottle at work and see if that weird guy across the aisle tries to report you for drinking on the job. (Extra bonus hint: don't drink on the job, at least that day). We've been told that our apparel makes excellent Christmas gifts -- bonus! If we had to choose, we'd still rather give a growler, but that said, there's something nice about keeping warm in a stylish manner this time of the year. If you're of the same mindset, we've got your bases covered. Zip-up Hoodie $45 Lightweight & super soft cotton makes this a go-to zip-up that may never leave your body. Hopstar logo screened on front, "Fulton MPLS MINN Brewing" screened on back, with cool extras like thumbholes in the sleeves and a headphone pass-thru in the pocket. Pullover Hoodie $40 You say "pullover", Harry Dunne says "no, it's a cardigan, but thanks for noticing." Grey, medium weight, featuring a skyline screenprint on the front & a hopstar on the side of the hood. Hopstar Beanie $15 Pick up one of these hopstar beanies to cover your ears, and get a couple more to cover the stocking stuffer needs on your Christmas shopping list. Like all of our gear, you can pick it up on the gear section of our website as well as at the taproom.